Pediatric Medical experts at the University of Chicago state that pediatric neck masses are often painless masses on the throat and neck areas of children. Professionals say that these are common problems with children. Out of all cases, 80-90 percent of pediatric neck masses are benign while the rest are malignant. Even as a larger percentage of the neck masses are mild, they are brought by infectious causes and should be treated urgently. Lymphoma is the leading cause of neck masses in children with non-Hodgkin’s lymphoma being common in children than Hodgkin’s lymphoma. Patients suffering from lymphoma need chest radiography to evaluate the likelihood of mediastinal challenges or imminent respiratory problems. If you suspect that your child has pediatric neck masses, let a qualified medical doctor carry out tests such as imaging and laboratory examinations. The doctor should have pediatric experience and thorough knowledge of the anatomy of the neck, including neck muscles, veins, ducts, cartilages, bones, glands, and bones. Diagnosis of the condition should involve careful evaluation of the patent’s history and physical aspects. Usually, a pediatric office can diagnose the condition and let the suspected patient go home the same day. Causes of these growths can be present in any part of the neck’s anatomy. The doctor should conduct a number of differential diagnosis procedures to observe the neck. If the doctor suspects the patient indeed suffers from the condition, the office should plan treatment options or refer the patient to a reputable surgical center. Otolaryngologists are doctors and surgeons trained to diagnose, manage and treat diseases of the ear, nose and throat (ENT). They are the professionals that will examine your child for neck masses and propose a way of removing these. According to the American Academy of Otolaryngology, these experts have a vast knowledge of the larynx, nasal sinuses and throat infections and diseases. 35 million people, including children, develop chronic problems of these organs, making these professionals among the most sought after in America. The following are details and salient features for the diagnosis. These are the most frequent pediatric neck masses during infancy and are common in the neck. Typically, lesions appear 2-4 weeks after childbirth and reproduce fast over the next 6-8 months of life. The appearance of hemangioma varies on the location. Generally, all these masses are reddish-bluish, soft and raised. More masses may exist inside the area where visible ones are located. Doctors should check the glottis and subglottis to ensure that they don’t pose life-threatening blockage of airwaves. Physical examination of children after the first few weeks of birth may expose the existence of hemangiomas. A majority of these complications can be managed with time. Today, topical and oral administration of propranolol is a viable treatment option. In the recent past, pediatric doctors referred to these as cystic hygromas or lymphangiomas. These masses are non-tender, mobile and spongy, appearing on the left side of the neck. To examine their extension, an X-ray of the chest is ideal. The size and salient features of these pediatric neck masses determine the treatment procedure. Doctors may conduct simple surgical procedures for mild lesions and advanced surgery for multi-stage lymphatic malformations. Complications during surgery include bleeding, infection, lymphatic leakage and other undesirable conditions that may require the patient’s lengthy hospitalization. The University of Chicago states that these are the most common forms of neck masses affecting the midline area. They are caused by embryological tissues remaining in the thyroglossal duct. This duct exists from the tongue’s base to the thyroid gland in the neck. These are common with children below five years and occur in form of painless cysts along the child’s midline path. When swallowing or ejecting the tongue, the cyst may move up and down the throat. This is the most common type of pediatric neck masses and is often brought by malformation of the pharyngeal arches. While first cleft abnormalities affect the external auditory canal, second cleft abnormalities affect the lower lateral neck. Third and fourth cleft abnormalities cause difficulties in swallowing and passage of air. According to MedicineNet.com, malignant tumors in children can occur as a result of alcohol and cigarette smoke. This explains why women should avoid smoking and drinking alcohol when pregnant. Exposure to asbestos, wood dust and consumption of excessive preservatives can cause these tumors. Malignant tumors are identified by the location in the neck where they begin. Examples of malignant pediatric tumors occur in the thyroid, lymph nodes, nasal cavity, salivary glands, oral cavity, paranasal sinuses, larynx and pharynx. The exposure to UV rays from the sun, radiation to the neck and head are causes. Diseases such as Plummer-Vinson, Epstein-Barr virus infection and human papillomavirus (HPV) are causes of pediatric neck masses and other malignant tumors. 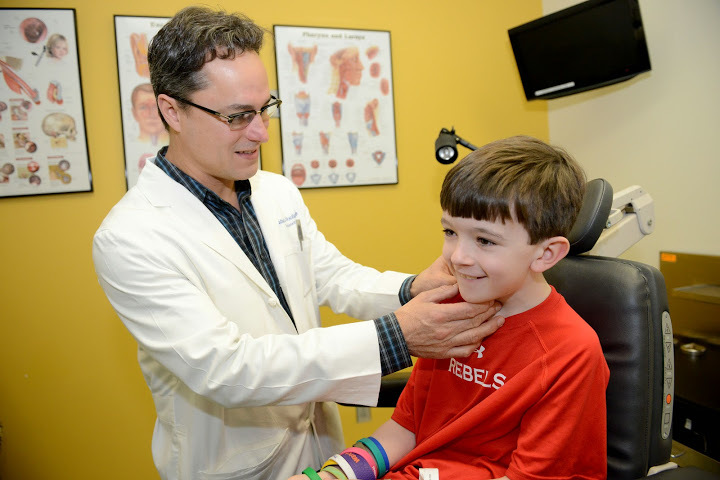 Pediatric ear, nose and throat surgery is often abbreviated to pediatric ENT surgery. Here, surgeons examine the occurrence and position of pediatric neck masses using x-rays and imaging scans. The treatment will depend on the type and location of tumors, cysts or masses that doctors discover in the neck. Simple surgeries can last a few minutes while complex procedures may take several hours. After removal of the cysts, patients are advised to take a rest and refrain from ordinary duties. Children may be advised to skip school for a couple of days or weeks after advanced procedures. Surgery is important to prevent malignant tumors from spreading and to stop obstruction of air paths. Doctors will administer pain-relieving drugs and medicine to prevent infection. However, you should observe the child and take them back to the center for continual examinations. The above are perhaps the most common types of neck masses in children. However, doctors should not rule out the existence of Neuroblastoma and melanoma, as these are common causes of malignancy in the lymph nodes of the neck. In addition, your child may suffer dermoid cysts, preauricular masses and vascular malformations. If you suspect a child has any of these conditions, contact Pediatric ENT Associates by calling (205) 831-0101 to obtain valuable information and to schedule an appointment. Next, read Does Your Child Need to be Checked for Hearing Loss?